At Dental Specialists of South Loop & North Shore, many of our patients with missing teeth may be able to wear upper dentures without issues, but some experience difficulties when it comes to eating or even everyday wear. The good news is there are several other implant-supported options from which you can choose when you’re missing a majority or all of your teeth. With two convenient locations to serve you- one in the South Loop in Chicago and another in Glenview, you can easily book an appointment to see how dental implant surgery can work for you. One of the most popular options is anchoring two implants into the lower jaw. Dentures then easily snap onto them. By choosing this option, the implants allow your lower denture to be stabilized while chewing. Since lower dentures may still move, sore spots can occur if any food becomes lodged. Just like other removable dentures, you will still need to make occasional appointments for adjustment. This option requires your dentist to place between four and six implants, depending on the shape and size of your jaw. After allowing time for healing, a custom-made support bar connects the implants together. The lab will then create dentures featuring specially designed retention clips that snap the dentures into place on the support bar. This process is otherwise known as an “overdenture.” Many patients choose this option as it’s more stable than a ball attachment, which means less movement. You will still be able to remove the dentures for maintenance and regular cleaning. Another option for tooth replacement requires us to place at least five implants into the jaw to which we will attach a permanent denture. 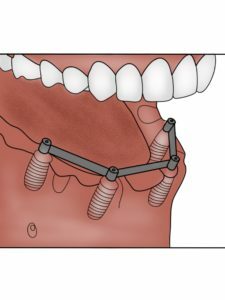 Screws or clasps are then used to secure the denture to the support posts or bar that’s part of the implants. Because there’s a space between the denture and your gums, it is easy to clean between them without removing the dentures. These dentures are a permanent solution to replace your missing teeth and will only be removed by your dentist for maintenance. It may take more time to clean beneath your dentures without removing them, and you will need to be instructed how to do so; this is often a preferred solution due to its permanence. Finally, you may choose to get implants that replace each of your teeth. This process will look more like natural teeth because they appear to grow directly out of the gums. You will typically need at least eight implants with separate support posts. Once these posts are in place, crowns are placed over them to create the effect of natural teeth. We may use sinus grafting to join the teeth, replacing bone strength, support, and height. This option is typically more expensive than other options because of the sheer number of implants and the process involved. This option may not be available depending on the current shape and size your jawbone. For those missing their upper teeth, there are similar options available. The upper jaw bone is softer than the one found in your lower jaw; you are likely to require more implants to provide the support replacement teeth require. With choosing an implant retained upper denture, we may be able to eliminate the covering over the roof of your mouth full dentures have. This means you will be able to enjoy the full taste of your food, while also allowing you to accurately sense the temperature of food. Your denture will still be removable but will offer a natural look and feel. If you are having problems with your current implants and dentures, missing teeth, or are just curious about what your options are- call Dental Specialists of South Loop and North Shore today. One of our specialists will be happy to answer any questions you may have and will come up with the best option for your needs. With two locations to choose from in the Chicagoland area, you are guaranteed to get the same quality care and cutting-edge technology at the South Loop as well as the Glenview location.